Dixon did just that, traveling the many roads that crisscrossed the West: Montana, Utah, Nevada, Arizona, and New Mexico. Lasting weeks, to even months, these trips provided Dixon with the inspiration to create. He was forever drawn to the vistas and peoples inhabiting these remote western lands. When Dixon first visited Arizona, at the turn of the century, it was wild, open territory, inhabited primarily by Hispanics and Native Americans. In 1902, he made his first visit to Lorenzo Hubbell’s Ganado trading post, and came away with wonderful sketches he would use as inspiration for many years to come. 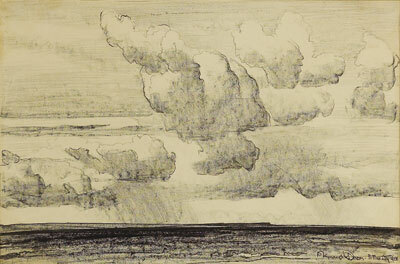 Viewing these works, one can imagine the awe Dixon felt in the raw beauty of the landscape and its inhabitants. He would return to Arizona many times, ultimately making Tucson his final home. The Arizona paintings represent the entire gamut of painting styles Dixon utilized during his productive career. Heavy impasto and bold colors typical of his work in the teens are seen in Dobe Town, Tempe 1915. 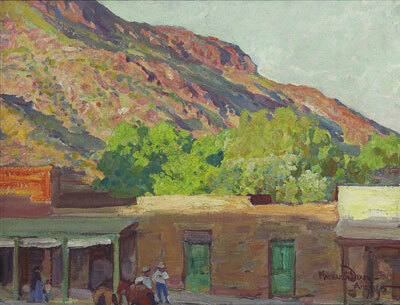 Executed on his 1915 trip to Arizona, Dixon stayed in Tempe and painted the local culture and architecture. 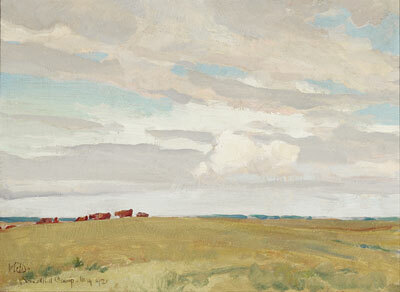 Many of these canvases depict real places and people that Dixon experienced between 1914, and 1916. Surrounded by the landscape and people of southern Arizona in the final years of his life, Dixon created works with a sparing use of paint and subdued color scheme. These paintings utilized Dixon’s powerful command of light and shadow and are often considered quintessential Dixon works. Although Dixon called California home for most of his life, this state was inspiration for only a fraction of the work he produced. 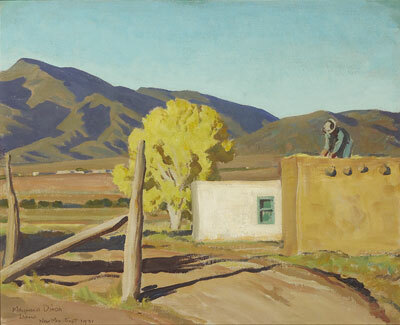 Many California paintings were done around his boyhood home of Refuge in the San Joaquin Valley; although many of these works look as if they could have been painted anywhere in the southwest. Portraying the important association between man and animal, Dixon captured another essential facet of early twentieth century western life. The horse and steer was a subject found throughout his career from his earliest drawings and illustrations. 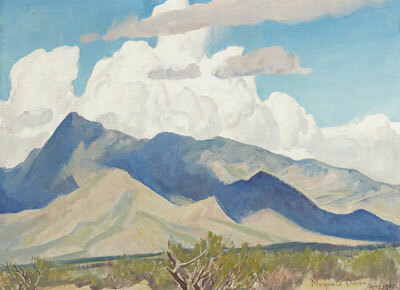 Like the majority of Dixon’s work, the California paintings primarily depict remote, desert landscapes. Although he visited Montana, the heavily-tree-laden vistas did not appeal to him as much as the barren southwestern deserts. The time Dixon spent in New Mexico from August, 1931 through January, 1932 was a happy, contented time. Living with wife Dorothea Lange, and children, in a house provided by his friend Mabel Dodge Luhan, Dixon completed some of his most productive and inspired paintings. During the five month stay, Dixon was very prolific, painting more than forty canvases of all sizes. Many of these paintings told a story about the interaction between the land its people. Signs of Autumn and Old Patio are outstanding New Mexico works. 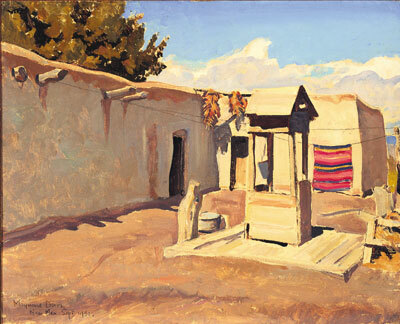 Both of these paintings depict the Hispanic culture – notice the Rio Grande blanket on the clothesline in Old Patio, as well as the portrayal of the adobe homes in which the local people, including Maynard, lived. At that time, Northern New Mexico was the heart of a thriving art community. The Taos Society, a group of well-trained and respected artists invited Dixon to join their exclusive alliance. True to form Dixon declined the offer, finding their bylaws on which paintings could be exhibited too confining and rigid. Dixon, the self-taught, highly individualistic painter, had great inner strength and distinctiveness. 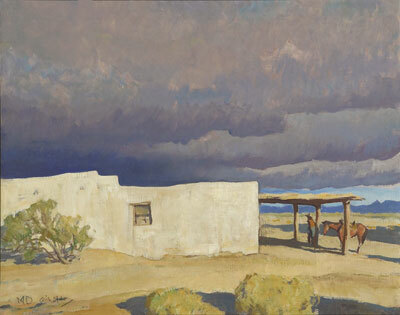 The New Mexico period represents some of Dixon’s finest works, ones in which his special qualities were clearly imparted. Nevada could have easily claimed Dixon as one of their own. If not for the cool weather and high altitude of Carson City, Dixon might well have spent his last years there instead of Tucson. 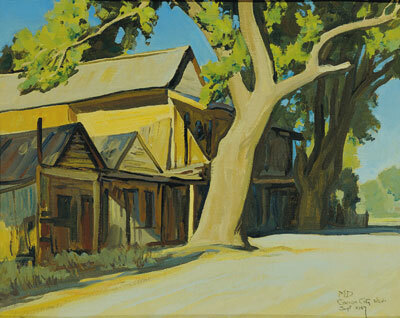 Many of his strongest canvases resulted from the places he visited in Nevada during the 1920’s and 30’s. A favorite and frequent subject of Dixon’s were the trees that prominently dotted this Southwestern terrain. Old Chinatown features a solitary cottonwood tree next to a building which, according to John Dixon, was a favorite local bar. Some of Dixon’s finest desert landscapes stem from his time in Nevada. The geographic area must have pleased Dixon. Utah was a favorite place of Dixon’s; he loved the light and found the Mormon people gracious and kind. Given his love for Utah, it seems fitting that Provo’s Brigham Young University has the largest museum collection of Maynard Dixon lifework paintings. 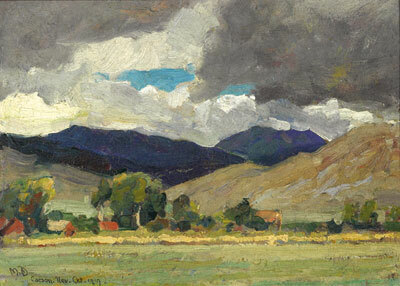 Most of the Utah paintings are from 1933 through 1945. Mount Carmel was Dixon’s summer retreat from the Arizona desert heat. Zion National Park was also a favorite area. While there are many landscapes of the harsh, unforgiving earth, Dixon also captured Utah’s serene mountain meadows. One only has to gaze upon these majestic paintings to understand Maynard Dixon’s vision of the west. Medicine Man Gallery’s upcoming show and exhibit of over thirty Dixon paintings will capture many of these remote western landscapes and their early twentieth century inhabitants. 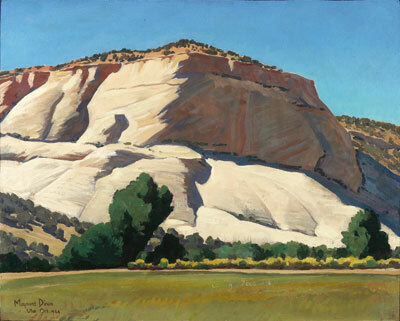 This article was excerpted from Mesas, Mountains and Man: The Western Vision of Maynard Dixon All rights reserved.